The art of forming and firing clay is an ancient craft. Using bricks for building first caught on in northern Germany in the late 12th century. The construction boom triggered by industrial expansion in Germany in the 1870s necessitated the mass production of bricks. This in turn prompted the development of suitable machinery and kilns. 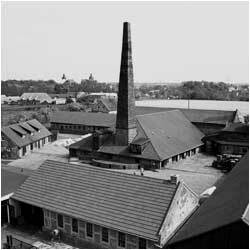 This historical development is reflected by Hundisburg Brickworks, founded in 1882. The almost completely handmade bricks were originally fired in ring kilns before the introduction of machine work in 1903. In 1938 the construction of the zigzag kiln and chamber dryers spelt the end of seasonal work. This method of production was maintained until the Brickworks was shut down in 1990. Nowadays visitors can vividly experience the history of brick prod uction.They can also try their hand at working with clay and take a ride on the historical narrow-gauge railway.